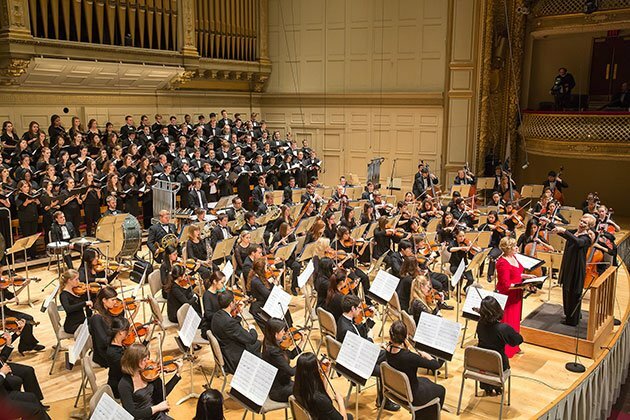 Symphony Hall shook on Monday night as conductor Ann Howard Jones led the Boston University Symphony Orchestra and Symphonic Chorus in a striking choral program. Works by Vaughan Williams and Ives graced the evening—the former in its full and terrifying symphonic glory, and the latter in a new arrangement for large orchestra. The evening was rounded out by Poulenc’s characteristic Gloria. The concert opened with Ralph Vaughan Williams’s Dona nobis pacem (1936). The last time that BU performed this piece was in 2006, to celebrate the then-recent inauguration of university president Robert A. Brown. That performance was at Carnegie Hall, however, and thus the last time that the university staged this work in Boston was back in 1995—18 years ago. Although area ensembles periodically tackle the work (the Spectrum Singers did so in 2011, for example), it is only rarely heard with anything approaching the musical resources that Boston University employed. The result is a dramatically different and much more powerful experience of the music. The composer’s full scoring demands a large chorus and a large orchestra, and asks much of them. The piano and pianissimo passages of the work are some of its most arresting, and the frequent orchestral interjections can easily overwhelm a choir’s diction in these circumstances. The singers must also contend with fortississimo passages, being heard over dueling brass and drums, and lengthy texts. With Ann Howard Jones at the helm, however, choral diction is always the last problem to be expected, and on Monday it did not disappoint. Under her baton, the chorus marched through a huge range of dynamics and expression, with an impressive build-up particularly seen in the “Dirge for Two Veterans”. The orchestral requirements are no less impressive. The brass section alone demands four horns, four trumpets, five trombones, and a tuba; it is no surprise that most performances take place with a greatly reduced arrangement. Hearing the full orchestration reveals unsuspected depths to Vaughan Williams’s craft as a composer, with unsuspected colors, deft choral-orchestral interactions, and extra-musical associations for various instruments. Much of these subtleties would be lost in the very live church acoustics in which the piece is generally staged or its vibrancy sucked away in a dry university concert hall; the balance in Symphony Hall was perfect for the piece. If the appointment of Andris Nelsons as the Music Director of the BSO has reawakened audience interest in watching the conductor, Jones did not disappoint on this account. She was clear, vivid, and evocative in telegraphing and preparing accents and changes. It would have been very easy for the orchestra to overpower the chorus at countless moments, but this fine line was approached but never crossed. Dona nobis pacem is not just a choral work, however, and the soloists have both extensive musical and dramatic contributions. At BU’s 2006 performance, the soloists were the incomparable Metropolitan Opera bass-baritone Simon Estes and the then-student soprano Michelle Johnson who also went on to the Met. 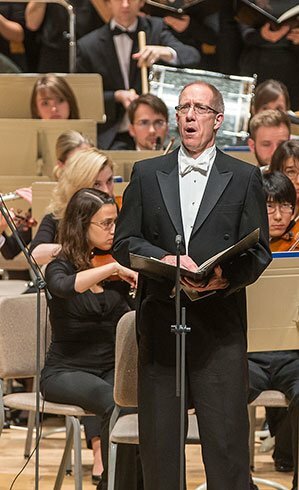 Monday’s soloists were baritone James Demler and soprano Lynn Eustis, both current members of the university’s voice faculty. Demler’s dark, haunting delivery of “The Angel of Death” raised goosebumps and sent shivers through the audience; in more upbeat, prophetic passages, his singing assumed an entirely different (but no less striking) character. Eustis’s performance, extolling the “Agnus Dei” (“Lamb of God”) and refrains of “Dona nobis pacem” (“Give us rest”), explored the more plaintive side. Unfortunately, her diction was not a highlight, with numerous starting consonants being essentially inaudible (this extended also to the Poulenc Gloria). Hopefully on return visits she will have more time to become accustomed to the acoustics, as this is not usually a problem one encounters in Symphony Hall. The chorus and orchestra at large rose to the occasions in this demanding piece; one of the chorus’s finest moments was the canonic section “We looked for peace…” (a quotation from the Book of Jeremiah) and its exploration of desolation and destruction. There were numerous feats throughout by the brass, percussion, and woodwinds, but concertmaster Hynn Jikim’s moving violin solo during the “Reconciliation” and Neal Andrews’s trumpet solo during the “Dirge for Two Veterans” merit special commendations. The return after intermission for Francis Poulenc’s Gloria (1960) was almost anticlimactic. This was not because of the quality of the work, but because it’s construction is something entirely different. This old BSO commission is a musical potpourri, replete with sudden stylistic shifts; although it has its own arc of sorts, it is not conceived in the same order of magnitude as the Dona nobis pacem that preceded it. 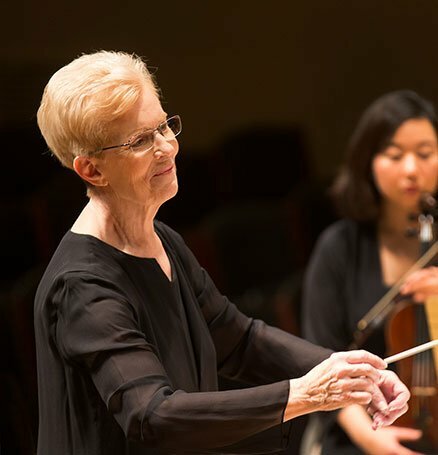 Much of the orchestra was able to go on break while the chorus and Ann Howard Jones navigated the ever-shifting aesthetics; Lynn Eustis returned as the soprano soloist. The back and forth between parts in the “Laudamus te” stood out particularly well, as did the instrumental introduction to the “Domine Deus, Rex caelestis”. As programming goes, this functioned somewhat as a palette cleanser after one heavy musical meal and an amuse-bouche for the final course. The last piece on the program was Charles Ives’s Psalm 90 (1923), using a new orchestration prepared by BU’s David Hoose. In his program notes, Hoose states that this “makes no attempt to imitate Ives’ extraordinary use of the orchestra” and addresses some uncertainties about the organ part’s doubling of the chorus. The end result essentially replaces the use of the organ with an orchestra that selectively doubles the chorus. This was a different but not unappealing way of hearing the composition, especially since the trademark bells were left unaltered; the chorus part also stood out better over the contrasting timbre of the strings. Ann Howard Jones drew a more hushed, devotional sound from the ensemble that rose into a proud, vibrant proclamation.